← Exciting News! Book Roadie blank notebooks availble at Wanderlust in PDX! So, anybody who’s interacted with me in a bookbinding context has probably already figured out that I’m a paper geek. I love paper. Love it. Naturally I am SUPER excited about the paper in the photo below! It’s from the fantastic Pulp & Deckle, a papermaking studio here in Portland. 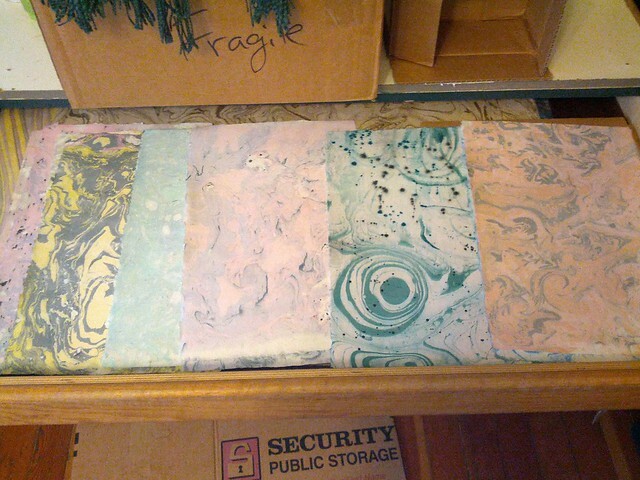 They graciously made me a bunch of handmade, hand-marbled papers to use as endpapers, and I am SO EXCITED. Pulp & Deckle papers in my thrilling newish flat file! Look at that loveliness! They use recycled and reclaimed materials (like old sheets from thrift stores and used wrapping paper!) to make this lovely, thick, soft paper. I am smitten. I’ve already got one book in progress using a pair of these for endsheets, and I will soon have many more, I’m sure. This entry was posted in Hangin' out Backstage and tagged paper, short and sweet, supplies. Bookmark the permalink.